tempered/herculite ® doors can be installed within 48 hours! Nothing is more attractive and inviting than an all glass entrance door. 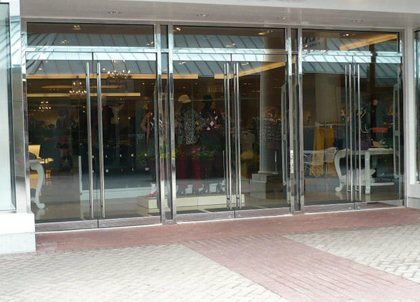 Retail businesses that rely on high visibility find all glass tempered and Herculite brand doors to be the answer. Whether it's an executive office, mall storefront, or custom home application, Herculite® and tempered glass doors provide a more open light filled appearance while making a bold design statement. With a wide variety of metal and hardware finishes, you can create a look that's uniquely yours. Universal Glass can custom design and install single or double Herculite® door entrances for your unique application. We've been designing, installing and maintaining Herculite® brand and other tempered glass entrance doors for over 30 years.We'd be happy to have one of our knowledgeable glaziers visit your location to give you all your available options so that you can make the most informed decision possible.